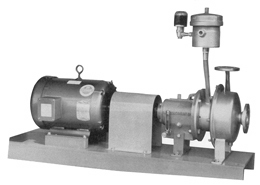 Recirculating pump for "heavy water" (0.89 SG & 73 Cp viscosity), designed for 250°C (482°F) and 700 PSI inlet pressure: 8 GPM @ 40 FT TH (19.5 PSI boost). (carbon vs. silicon carbide mating faces), 1 1/8"
Scrubber recycle pumps for municipal sludge management facility, rate 100 GPM at 75 FT TH, required zero emmision and full independence. 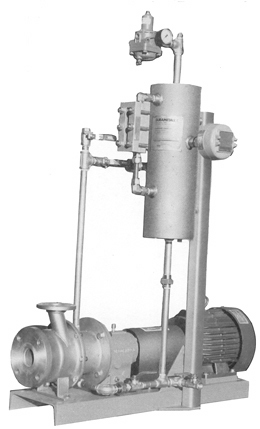 Size: 3 x 1 1/2 FF FL - 4.75"
Chemical plant constructor required "Heavy-Duty Pedestal Mount Hydrocarbon Liquid Centrifugal Pump" for liquified natural gas facility: 326 PSI inlet pressure (duty: 96 GPM @ 15 PSI boost @ 0.54 SG). Single, internal mechanical seal, 1 1/8"
(Plan 53 double seal vessels supplied by customer). (shaft: one piece, round bar, ASTM Grade 4). Single internal metal bellows mechanical seal: 1.750" dia. Silicon Carbide vs. Silicon Carbide mating faces, Viton O-rings, Hastelloy C-276 metal parts. Lombardi diesel single cylinder compact engine with electric starter, alternator and fuel tank: 10 HP, 1200 rpm, diesel engine, 12 volt battery. Includes channel steel baseplate, Rexnord Omega spacer coupling and guard. Complete unit shipped in under three weeks. Self-prime JP-4 fuel at rate of 300 GPM at 81 FT total head. 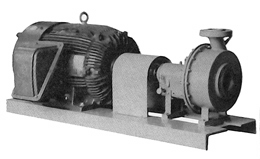 Reliance 10HP, 1750 RPM explosion proof motor with non-sparking non-reverse ratchet mechanism. 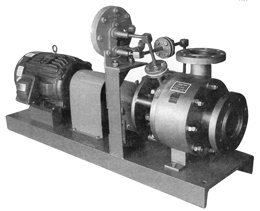 Pump boiler feed water (255° F, 0.93 SG) at rate of 27 USGPM @ 360 PSIG (773 Ft TH) boost. Two-stage design, with opposed impellers (enclosed 1/4" wide vanes). Rear suction (single, internal mechanical seal sees only suction pressure). Crane type 2 (1.750") mechanical seal (XF1D1), Carbon vs. T.C., Viton Elastomers. Group II oil lube bearing pedestal. 40 HP, 3450 RPM, TEFC-XP motor. Certified Hydrostatic and QHP tests. 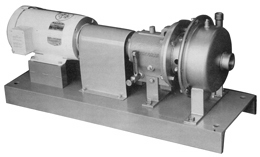 Pump various mixtures of chromic acid and sulfuric acid at high temperatures - up to 160°F. Performance: 1000 GPM at 150 FT at 1750 RPM (75 HP non-overload). Available: Group I and Group II ANSI B73.1 size. Built to conform to 2x1-13 ANSI A 10-2 dimensions. Major midwest steel producer required corrosion-resistant pumps (4) for "strong ammonia liquor" application (NH 3, H 2S, HCN) with smooth, vibration-free operation under low flow, high head conditions: 20 GPM @ 139 FT TH and 35 GPM @ 128 FT TH. Crane type 9 mechanical seal (1.750"), chemical grade carbon vs. silicon carbide, EPDM O-ring on seat, titanium metal parts. Stainless steel channel base, coupling guard, bearing pedestal bracket & sight gauge. 10 HP, 1750 RPM, XP motor. Certified Hydrostatic and Performance tests. Crane type T-515E (2.750") cartridge mechanical seal Code: XP90 1 058. Group III bearing pedestal with Inpro VBX bearing isolators, Synergy 790 lube oil, and vented oil level gauge with thermometer. 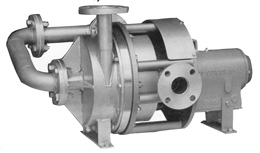 Full-size enclosed impeller (14.5" Dia.) with 3" wide vanes and integral repeller for approx. 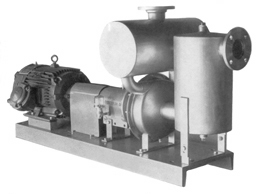 1415 RPM operation (belt driven). Engine valve manufacturing company required 800 GPM @ 200 FT TH of deionized water at ambient temperature. All wetted parts: 316 (L) Stainless Steel. 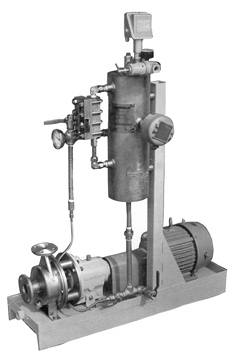 Group III oil lube bearing pedestal with air dryer constant level oiler and oil thermometer. Mechanical seal: 2.500" type 2140V (carbon vs silicon carbide faces, viton elastomers and 316 Stainless Steel metal parts). Fabricated and reinforced channel steel base: 20x68. 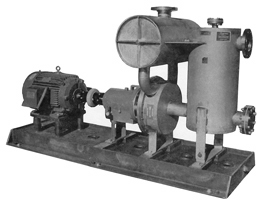 Motor: 75HP, 1750 RPM, TEFC, 365T. Single internal mechanical seal: Sealol type 670 metal bellows (2 1/2") with silicon carbide faces, Kalrez elastomers and Hastelloy C-276 metal parts. The limey water is dried out and the residue ("drive lime") exported to Florida for use in road repair. Single internal mechanical seal (2 1/2"): carbon vs. silicon carbide mating faces, viton elastomers and 316 S/S metal parts. 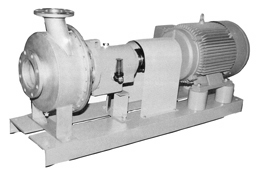 Impeller: fully enclosed, 5 blade, 1 7/8" solids handling capability, 15" diameter.